You must select the proper shipping state from the drop down list to add the appropriate add-on fee for your state. If you fail to do this, it will hold up your order, and require a second credit card billing. 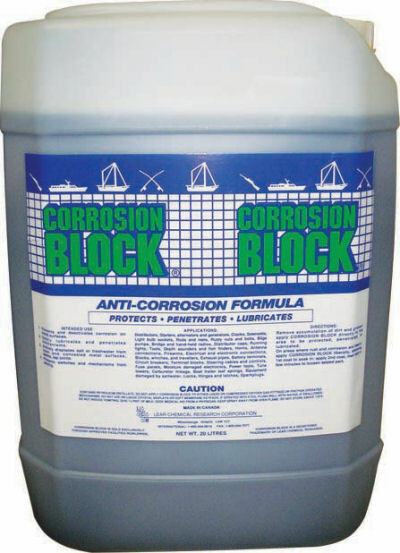 ON SALE NOW.....and In Stock........ 5.28 gallon (20 liter) container of Corrosion Block. The shipping fees are based on USPS Priority Mail rates. If we can get a lower rate with UPS, we'll credit your card for the lower fee difference. This is a very heavy container, so shipping is not cheap, especially to states in the middle of the country, or western states. This is the same, liquid Corrosion Block as in the aerosol cans, but in a bulk container. You may use most spray bottles to spray this product if you choose, or a commercial type sprayer.